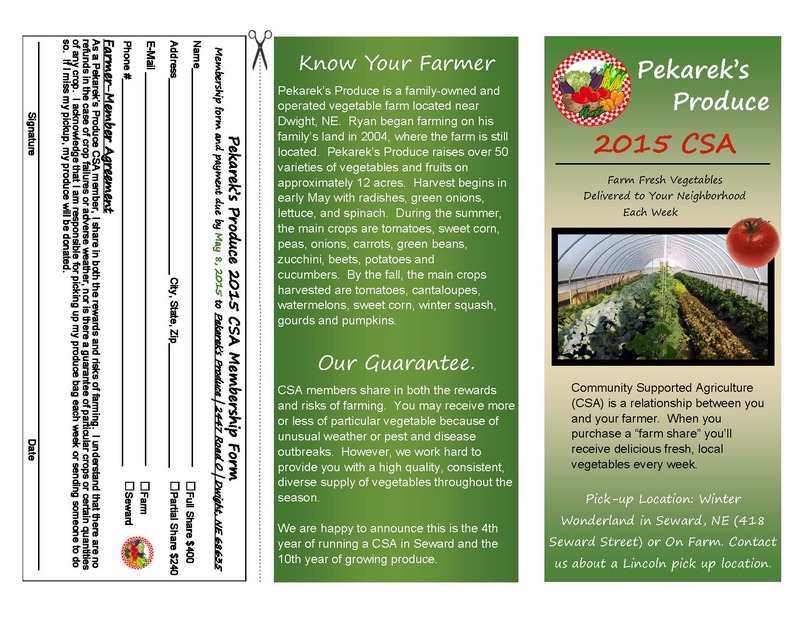 We are extremely excited about the 2015 Pekarek’s Produce CSA! 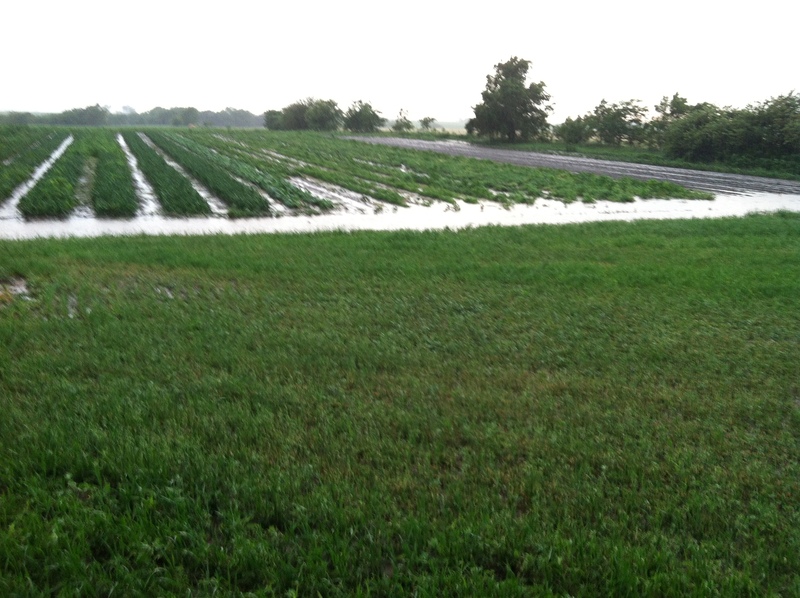 So far, the year has been a muddy mess and today’s produce has seen it’s fair share of rain. By joining the Pekarek’s Produce CSA, you not only receive a weekly bag of fresh and delicious vegetables, but you are also helping to strengthen our local food security, contribute to the local economy and support a small family farm (that’s us!) – so THANK YOU. Hopefully you all know where you are picking up your weekly bag of produce. 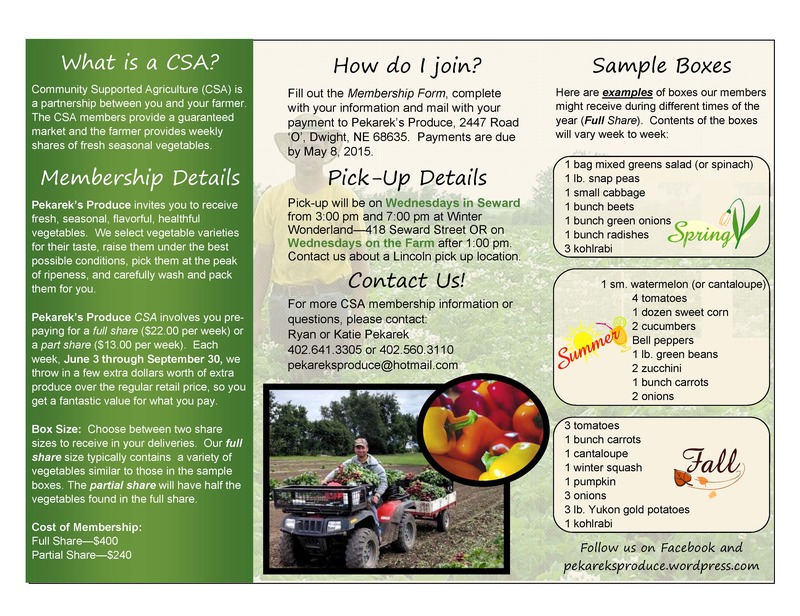 CSA bags are being picked up on Wednesdays from 4-7pm in Seward at Winter Wonderland, 4-7pm in Lincoln at Schillingbridge Tap and Cork, and 1pm – evening on the farm. Each week you will go to your pre-selected location (farm, Seward, or Lincoln) and find the Pekarek’s Produce bag labeled with your name. We have multiple people with the same last name, so you may have to look for your first initial as well. The following week you will bring back (RETURN) your empty bag and leave it at the site in an empty black crate. You will then be able to pick up a new bag, with your name on it, full of vegetables. This means you will have 2 bags with your name that will be in circulation. It is possible you will have a bag with your name duck-taped on for the first week. This will only be temporary and you will receive your permanent bags in week 2. For those of you who are new to the CSA, Pekarek’s Produce is run by my husband Ryan, and me, Katie. Ryan got a Master’s degree from North Carolina State University in Vegetable Production and began raising vegetables in 2004, while in college. In 2009, we began vegetable farming full time. All of the produce is grown on our family land just 14 miles north of Seward. 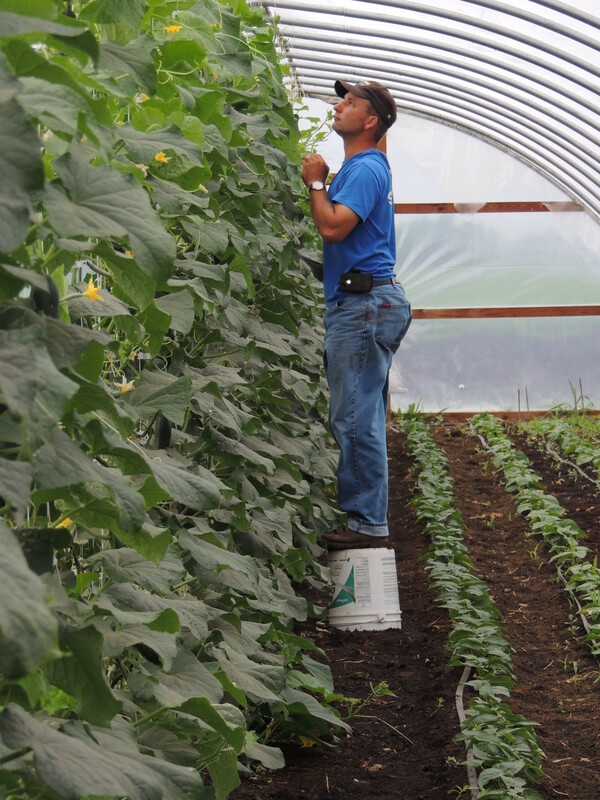 Pekarek’s Produce now raises over 50 varieties of crops on approximately 14 acres. 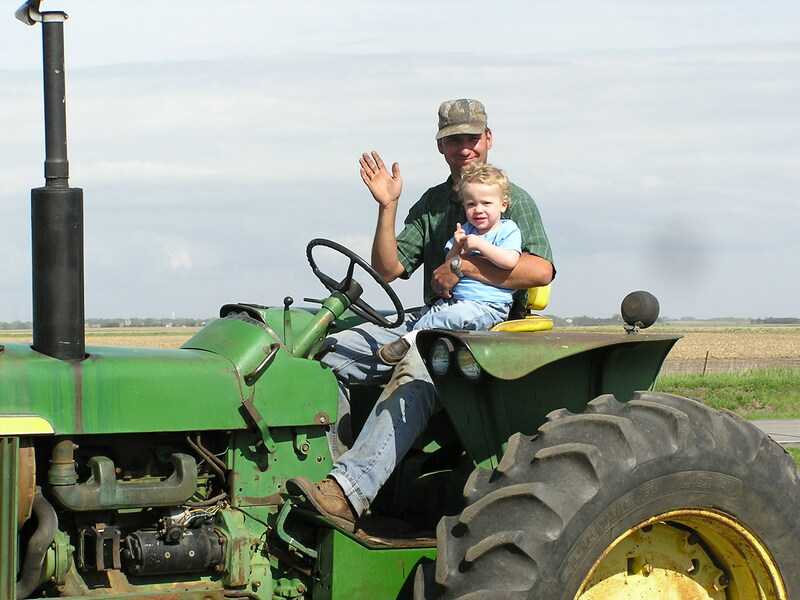 With the help of a small local crew, we tackle the many aspects of farming: seeding, transplanting, watering, hoeing, weeding, harvesting and much more. We have three kids (Jacob, Margret, and Michael), who as they get older, help out a little more each year. Each week, we will have a short newsletter describing some aspect of the farm, from hilling potatoes to building cold frames and more. As Ryan is always covered in dirt or mud, your newsletters will come from me, but if you’ve ever met Ryan, you can be sure he won’t be silent. We look forward to a great season! Each week there will be recipes available for some of the seasonal vegetables you receive on our blog at pekareksproduce.wordpress.com. CSA Signups are open!! Get your weekly supply of veggies. I hope you are as excited as we are…it’s time to sign up for your weekly bag of vegetables! email pekareksproduce@hotmail.com to make a request. We’d love to talk to you, so if you have any questions feel free to call or stop by the farm. Hope to hear from you soon! Well its that time of year again when the kids go back to school! This year we have had an excellent, motivated, crew that has put in several hours of weeding, picking, washing, shredding, and prepping your vegetables. Next week, only Ryan and Laura will remain on the farm full time as most of the crew heads off to school. In the early part of the week Ryan and crew picked and picked and picked! Due to some higher than average demand for our vegetables, that’s about all they’ve had time to do. Ryan has also continued the irrigation marathon that began last month. We continue to put fall crops out into the field and watch as the pumpkins and winter squash take shape and grow. This week I thought I would share with you some of our work with the Nebraska Department of Agriculture (NDA). 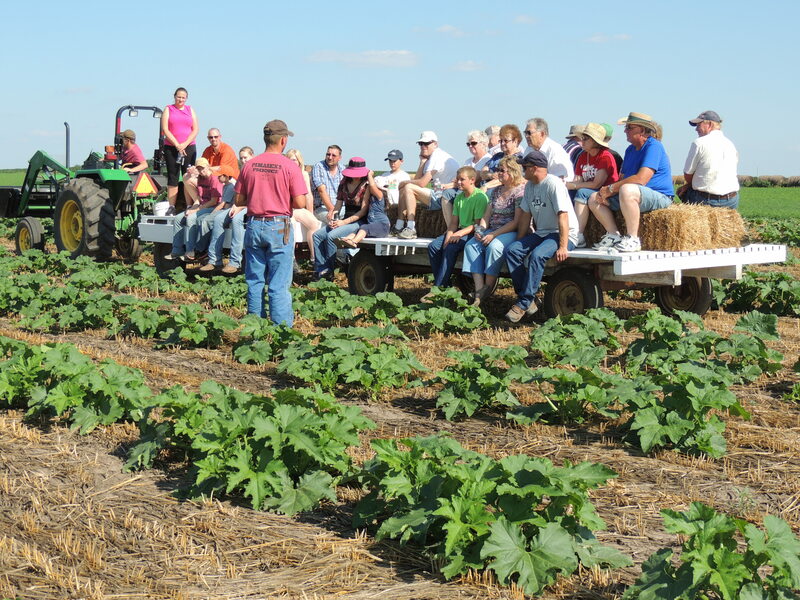 In early 2013 we received a grant from the NDA to increase the length of the season we can produce cantaloupe on the farm in Nebraska. This grant assisted us in the purchase of a plastic mulch layer (with drip tape laying abilities) that pulls behind the tractor. We have been testing the success of a variety of plastic mulches, including different thicknesses, textures, materials, and variations on biodegradeable. In the picture above, Alex is getting the plastic ready to go. One person pulls the two lines of drip tape down and then pulls the plastic under the two side wheels. The person behind the tractor (Alex in this case) then holds the tape and plastic in place until the tractor gets moving. The discs throw dirt onto the sides of the plastic to hold it in place. And we shovel the ends with to keep them from flapping. The first few times we used this required a bit of trial and error in getting the bed prep correct, having the right temperatures outside, the right wind, and the right soil moisture. Now it usually goes out pretty smooth. Well after the wet spring we had it seems as though the rain has been shut off. So the name of the game at Pekarek’s Produce has become IRRIGATION! Amongst all of the other daily and weekly work on the farm, Ryan is now running irrigation non-stop. We irrigate as much of our produce as we can get too in a couple ways. Most of our produce runs off of a drip irrigation system. 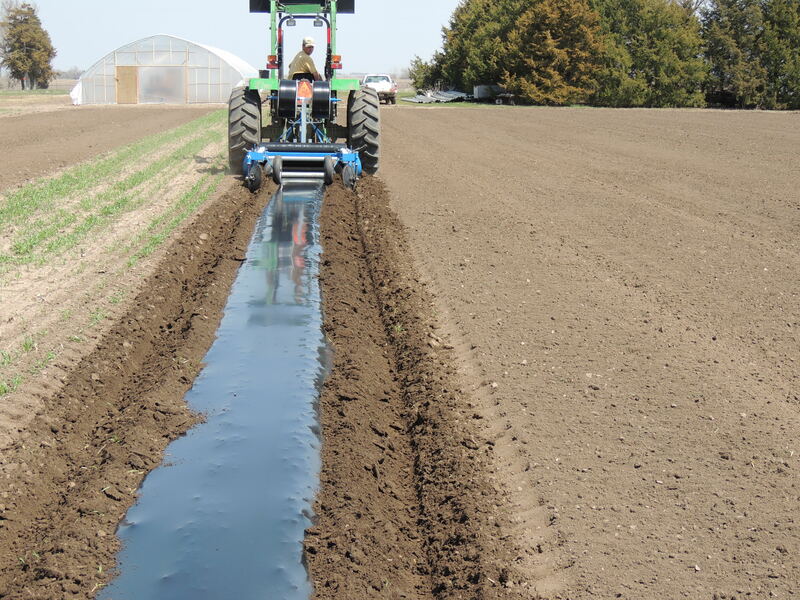 Last year we purchased a system which we can pull behind a tractor to make a raised bed, which mounds a flat layer of dirt where vegetables can grow, lay down plastic mulch, and pull drip tape at the same time. Not all of the produce is grown on plastic or raised beds however, so much of the drip tape we lay out by hand, which usually entails Ryan or Alex moving a big roll of drip tape and pulling the black tape in a straight line along the vegetables. Unfortunately, when it did try to rain once during the last week, we instead ended up with ping pong ball size hail followed by peas sized hail for 5-10 minutes. It has definitely done some damage to the fruits that were already set on plants like zucchini, cucumbers, tomatoes, eggplants, and some pumpkins and squash. Today (July 30) we’ve also been doing some transplanting. After raising plants in trays under the protection of a plastic greenhouse, they are ready to be planted. We used to take the plants from the trays, crawl on hands and knees, and plant. 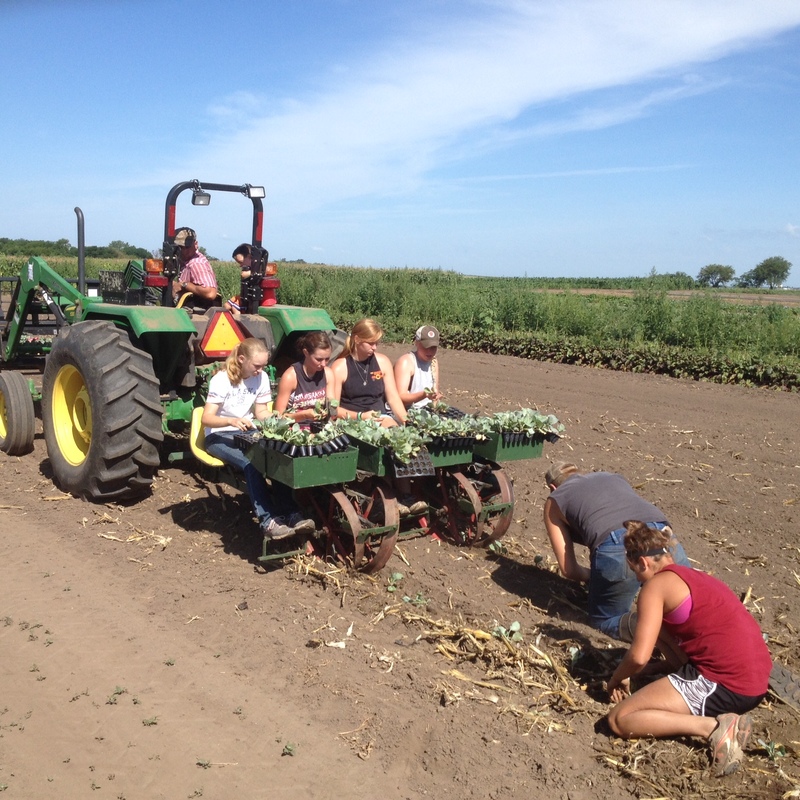 Now, we have Ryan drive the tractor, with a four person transplanter pulled behind. Two people alternate planting in one row and one or two people follow behind to make sure things were planted correctly. 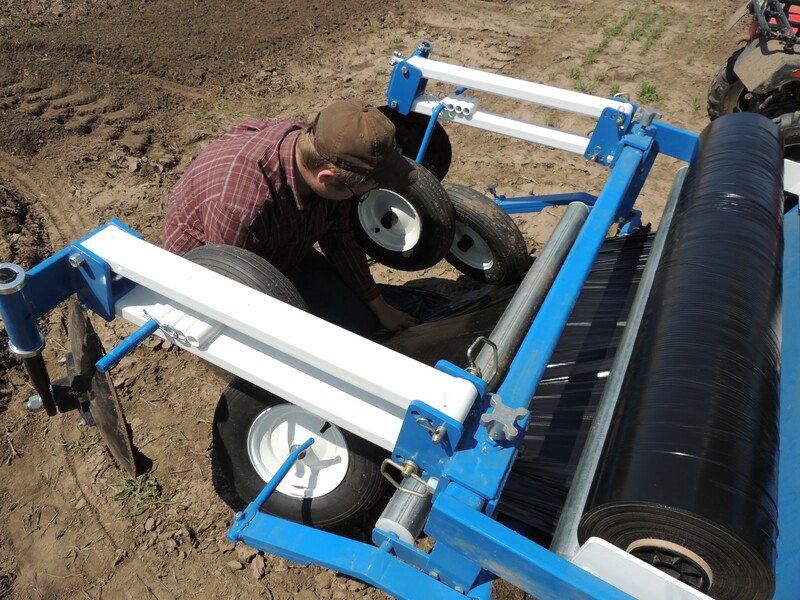 The transplanter basically has “fingers” on a wheel that move as the tractor moves. A person puts the plants in the finger, the transplanter makes a furrow for the plant to be planted in, and then the transplanter closes it up. All in all, it is a life saver for all of us! Wow! This has been crazy July weather. We’ve all been enjoying the seasonally cool weather this summer and have even had some July mornings picking vegetables in sweatshirts. 55 degrees overnight (note the sweatshirts and long sleeves in JULY!) doesn’t usually hit at the same time as cucumber and zucchini season. The only downside is that the melons need lots of heat to get a good crop and the tomatoes turn colors a bit slower. Lucky for us, it seems the heat is turning back on this week. All in all, we are doing well though. Each year, when we have an excess of produce, we make sure to get it to the people who need it. This year, as in years prior, we donate any excess produce to a variety of locations. In an effort to keep it as local as possible, the bulk of our excess produce goes to FoodNet in and around Seward. We are grateful to have such a great organization in the community which to help us distribute the produce. We are sure you’ve been enjoying your weekly produce bags, but now’s the time to start thinking about what you will eat this winter. Are you interested in canning or freezing this summer? We have cucumbers, green beans, cabbage, beets, sweet corn, and peppers available in bulk orders for freezing or canning. Bulk pricing for these crops and more is available. Give us a call (40two 6 four 1-33 zero 5) and we can arrange special pick up/delivery or if you give us a couple days notice, we can have your bulk order ready at the time of your CSA pick up. You all know we love our CSA members, but you may not know where the rest of our vegetables go. Today I wanted to tell you about a couple other places our vegetables end up throughout the year. Most Saturdays throughout the year, you will see one or two people coming through the market with black and white, vertical striped, puffy pants and neat white jackets with their first name in black cursive on them. That’s Kevin and or his sous chef from the restaurant Bread & Cup, a restaurant in the Haymarket that opened in 2007. Each Saturday, this restaurant features a Market Meal. Kevin walks through the market looking at what is seasonal and then decides what will be on the menu that night, much like you as CSA members don’t know what vegetables you will have to cook with until you open your CSA bag. We like to think it’s a little bit like Christmas:) At the restaurant, Pekarek’s Produce vegetables have been used in anything from grilled zucchini to roasted potatoes to sautéed turnips and kohlrabi with parsley to sweet and sour carrots to a creamed spinach and beet medley and more. We also deliver vegetables to an indoor farmer’s market and CSA in Omaha called Tomato Tomato. At this location we are usually harvesting anywhere from 500 to 1000 shares of one or two vegetables. One week we might bunch 1000 beets and the next week it might be 500 pounds of green beans. You can be sure that this keeps everybody on their toes. And speaking of Omaha, we still have one high tunnel structure to get home, but with all of the farm activities we have not yet accomplished this. We’ve already got plans for how we will be using this and the other high tunnels we brought home in pieces for next year! Tomatoes are starting to produce very well now, but next year we will put many more under the cover of a new high tunnel. The tomatoes are still grown in the ground (real dirt) but high tunnels passively (no heater) provide additional 2-4 degrees of heat during the early growing months, protect the crop in case of wind or hail, and help us to have more tomato crop earlier. 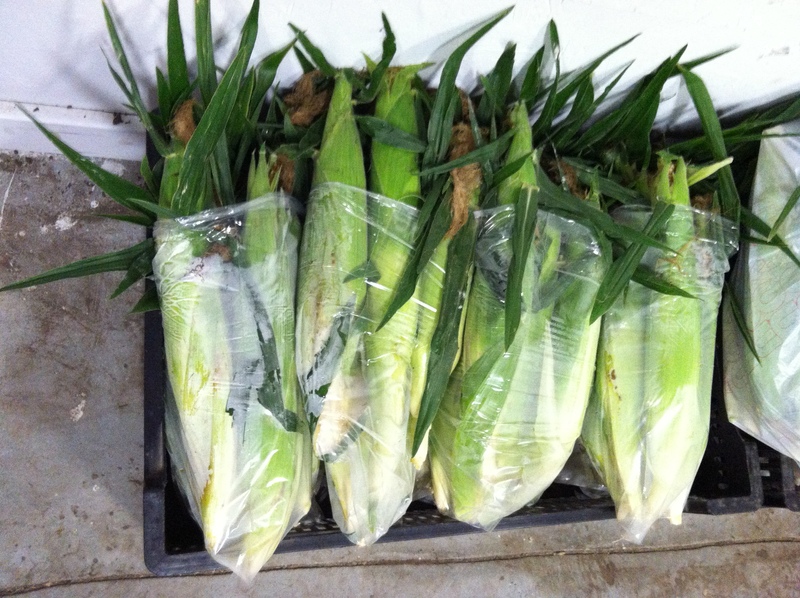 We also are excited to say that we’ve started harvesting sweet corn as of this past week. 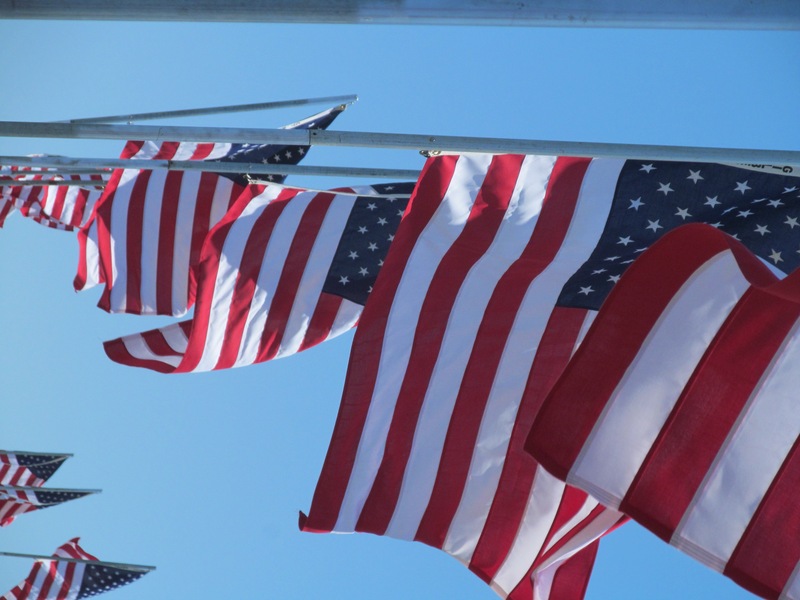 We didn’t quite have any by our July 4 goal, but we are happy none the less. Everybody has their favorite way of cooking sweet corn – mine being on the grill, out of the husks and brushed with olive oil so that it gets that nice smoky, charred flavor. But for our newer members who may still be experimenting with vegetables this year, you may try something simple. We recommend getting your water to a rolling boil. Boil the corn for 3 minutes, turn the burner off and let the corn sit for 6-7 minutes – then eat! No need to wait 30 minutes for boiled corn on the cob, its just that quick! We hope you all enjoy your produce this week and love to hear from you on how you are doing! We appreciate your continued participation in the CSA. Well, we survived the 4th of July weekend and even had some time to enjoy the fireworks! The greenhouse is about half full of transplants that we are growing for the fall. The weather is great for growing transplants, but as the temperatures heat up, we find ourselves watering the greenhouse several times of day just to keep the temperatures inside the greenhouse down and the plants growing. So far, everything is looking good! We caught another very small shower this week, but with rain forecasts on the low side for this week, we are preparing ourselves to start the watering marathon. Typically by this time of year we have been watering for a long time, so we are feeling pretty lucky at this point. Pickling cucumbers have really started to produce as of this week. Pickling cucumbers are different than slicing cucumbers in the way that they have been bread. We grow several varieties of each as our form of insurance. If we have total crop failure of one variety of cucumber, hopefully the other varieties can compensate for the loss. 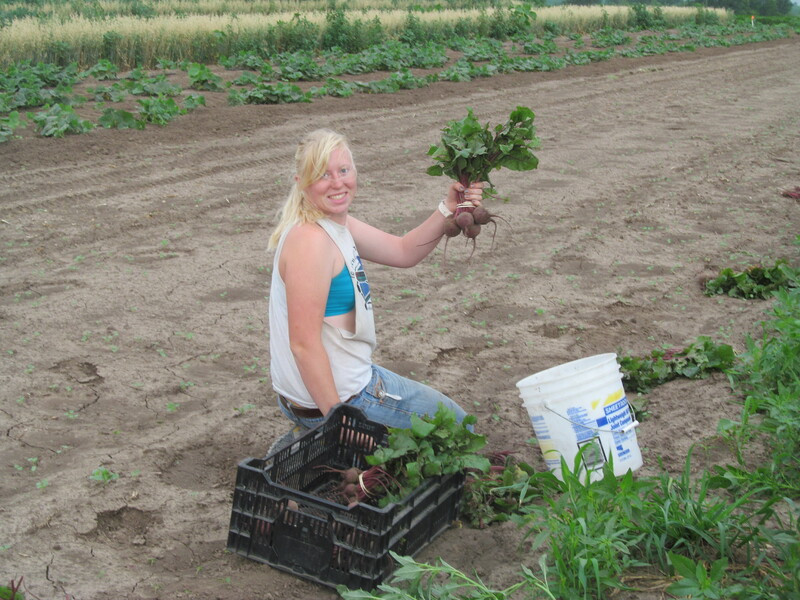 Finally, the crew had a “fun” time harvesting 500+ bunches of beets this week! In addition to our favorite Pekarek’s Produce CSA we also participate in a large CSA based out of Omaha which leads to harvesting large amounts of produce. This past week has been all about continuing the momentum here on the farm. There have been no major ups or downs, but consistency is the name of the game in the marathon vegetable season we run at Pekarek’s Produce. We survived yet another round of storms that came through on Friday night into Saturday morning. Some of the crops have seen some damage, been flooded and are being exposed to disease “growing” weather, but all-in-all it looks excellent around the farm. 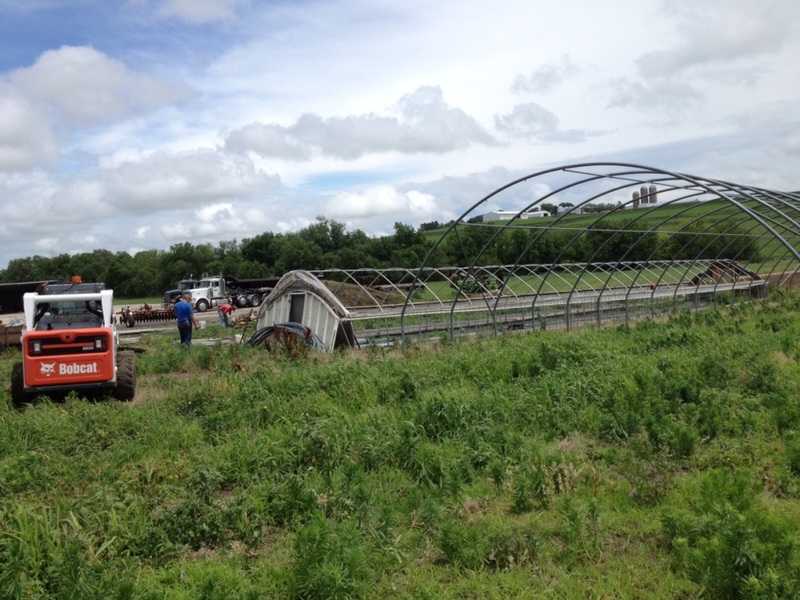 The remainder of the high tunnels have been torn down in Omaha. We got one more greenhouse drug home in pieces and have one more to go. They will sit in a nice little pile until the late fall when we are ready to begin construction. The sweet corn continues to get closer to harvest and we’ve started picking on the tomatoes under plastic, although the yields are still relatively low. We have also begun the zucchini harvest, again with low yields at this point. Peas are done L but green beans should begin to come off in around a week or so. 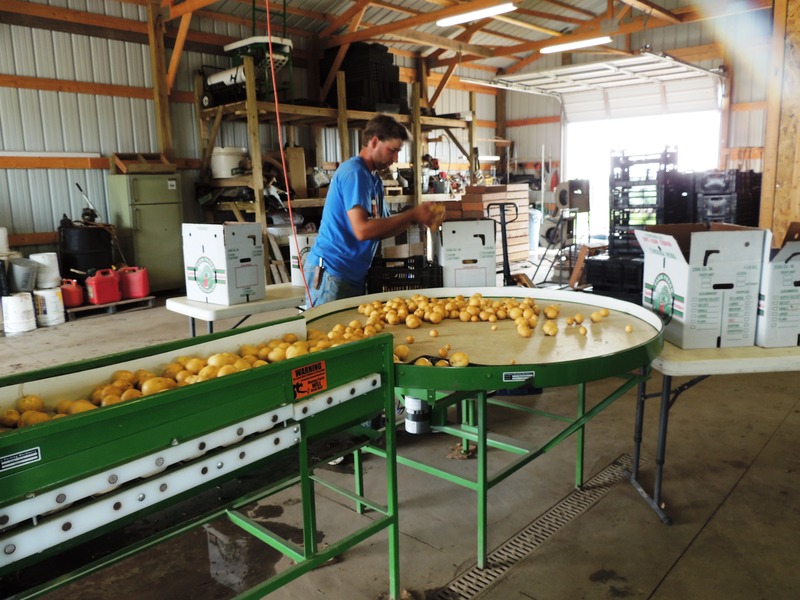 We are also about ready for potatoes to be harvested – Yukon Gold, Kennebec, and Norland Red. We continue to harvest good looking cabbage, broccoli, and cauliflower among the rest. Oh – and did I mention the 9 foot tall cucumber plants we are picking off of in the high tunnel… these are just cool to look at! Enjoy your produce! It seems like we’ve been in full swing on the farm for a long time now. Alex, Ryan and myself went to Omaha to tear down three greenhouses that Ryan found for us to purchase. It was an all-day event involving a bobcat, power tools, hammers, pliers, and a lot of grunting. In this picture, one of the small structures is already torn down completely and we have the other two partially completed. The two small tunnels are 14 X 96 and will likely function as high tunnels instead of greenhouses. That means there won’t be a heater or fans in the buildings, but they will be passively heated by the sun. The third larger building is approximately 30 X 96-ish and hopefully can be built into a greenhouse. More than likely we won’t begin work on these projects until late fall, preferably just before the ground freezes. 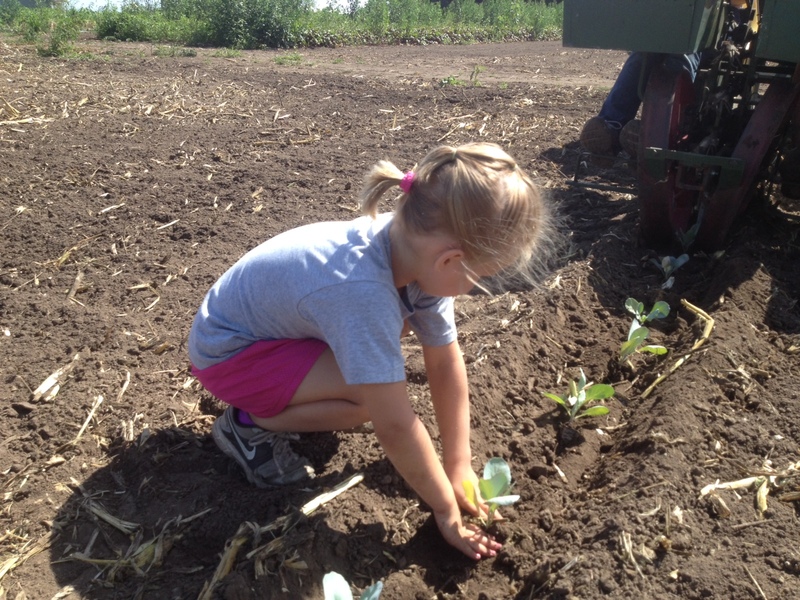 In addition to the labor in Omaha this week, we have been working on seeding cabbage and broccoli for the fall. Our fall crops will not only provide for some season extension, but also allows us the opportunity to work with grocery stores and dining halls. If you didn’t know, the first day of summer was this week and we are officially moving away from spring. That means that pea season is almost over already. 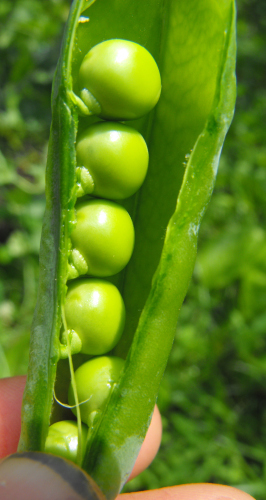 Although that makes many of us sad, it is not a bad deal for the crew that picks ALL THOSE PEAS! And with pea season ending, we are even closer to sweet corn, melon, and tomato season! The sweet corn is tasseling in the field and starting to silk and the tomatoes are blush red in the tunnel. 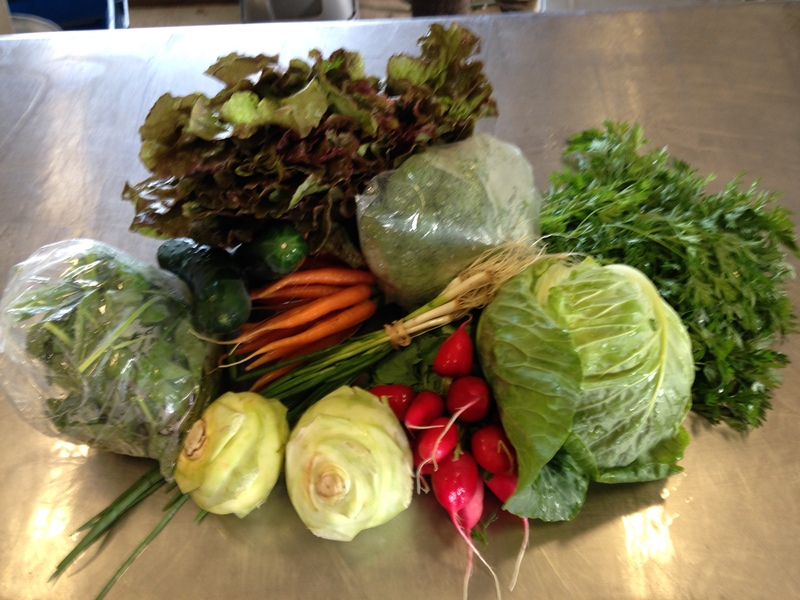 It’s time for a changing of the vegetable seasons at Pekarek’s Produce! We are excited to say that last week has been a busy and productive week at Pekarek’s Produce. With the warm weather and sun (most days) everything has been growing like gangbusters. We are also happy to say that your produce bags are nice and full. The farm is in full swing by June with harvesting crops, planting new crops, and weeding – not to mention other maintenance activities. One question we often get on the farm is what variety of a certain vegetable do we plant and when do we plant. While there are certain things that are pretty standard, like planting kohlrabi and radishes in the spring and fall, most of our plantings occur many, many times. The same piece of ground may have green onions in the spring and then have fall beets. And when it comes to variety selection, the process occurs all year, takes weeks to prepare and then order and rarely includes any less than three varieties of each vegetable! As for a weather update, we have estimated that our farm has received 17+ inches of rainfall since April 1, a significant portion of that falling sideways and some of it bringing pea-sized hail along with it. While this has caused washouts, a few small crop losses, and stunted growth for certain vegetables, it has also put some crops further ahead than they would typically be at this time of year. All-in-all, the farm is doing excellent and been very fortunate! 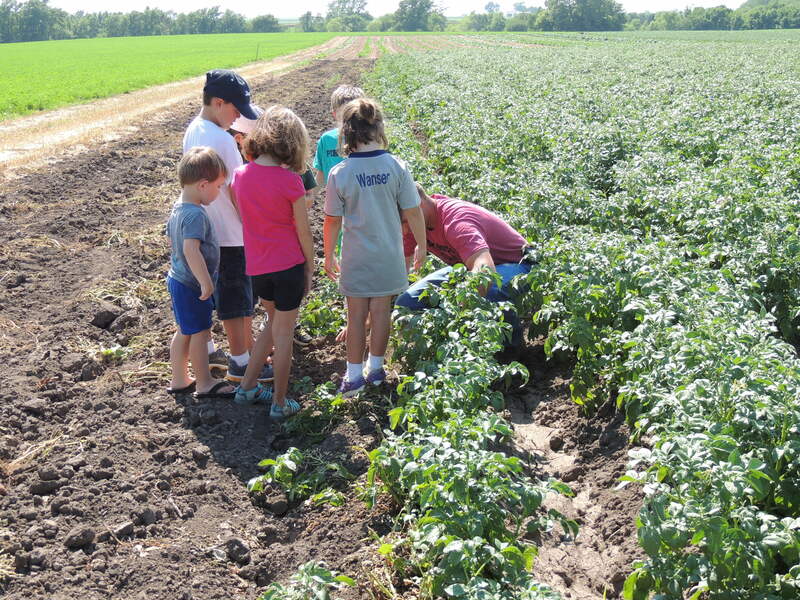 Finally, we will again be inviting all of our CSA members out to the farm for a tour this year. Even if you made it to last year’s tour, there have been a lot of changes. Plants are in different locations, we have new strawberries in the field, we have one new greenhouse on the farm and have moved a high tunnel over to our location. It may not even look like the same place! The date is not set for the tour yet, but look for more information in next week’s newsletter. Do you have a vegetable you’ve never eaten in your bag? 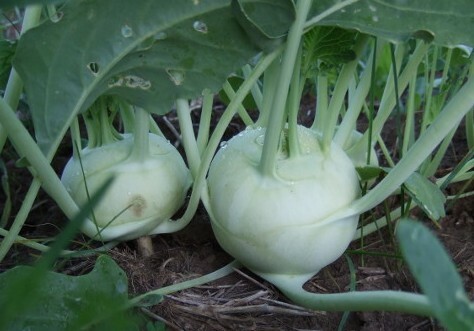 Not sure what to do with kohlrabi? 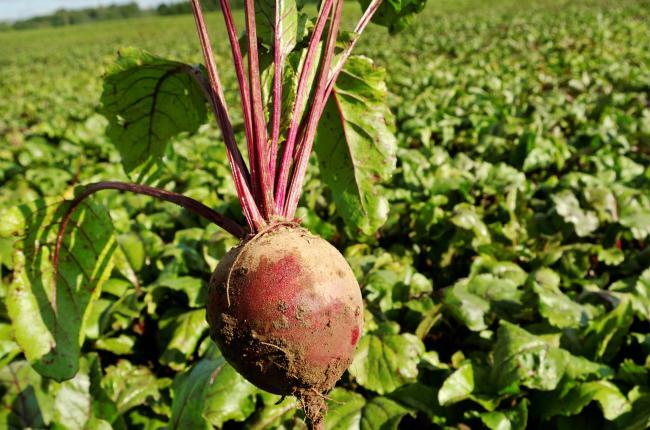 Maybe you’ve never had a beet in your grown-up life? Check out pekareksproduce.wordpress.com for recipes on all of these vegetables and more. And if you have a recipe you’d like to share, let us know – we’ll put the recipe up on the blog!